AMID interest from England and abroad, winger Jamie Walker revealed today that he wants to experience cup finals and European football with Hearts and has no plans to leave this summer. The Edinburgh club’s promotion back to the Scottish Premiership was confirmed at the weekend and Walker intends to stay for next season’s campaign. He believes Hearts could potentially challenge for third place in the top flight under the astute guidance of head coach Robbie Neilson. Spanish club Real Betis are amongst those who have noted Walker’s progress from Riccarton academy graduate into one of Scotland’s most exciting young forwards. He has scored eight goals in his last 11 games but his Hearts contract has another two years to run, therefore any transfer would involve a significant fee. Neilson hopes to keep the 21-year-old but has already acknowledged that sensible offers will be considered for any player in his squad. Walker explained that he has no intention of leaving Edinburgh with potentially exciting times on the horizon. Hearts are 23 points ahead in the Scottish Championship and have secured the title with seven games remaining. “I know myself it’s only the Championship. I know I’ve been playing well over the last few weeks but I’d like to give it a crack in the Premiership with Hearts. I’ll need to wait and see what happens over the summer,” he told the Evening News. “If an offer came in, it would be up to the club what they did. I have a family now and I’d need to think about that. Fighting off potential suitors for Walker may well be one of Neilson’s biggest challenges in the months ahead, something the head coach is already preparing for. He detailed the maturity in Walker which is attracting attention from other clubs. “In Scotland, there aren’t many players who have his ability. We see him every day in training and his work rate this season has been fantastic,” said Neilson. “I think his attitude has really changed and he’s really turned it round and been working hard. He has a son now and I think that’s given him a focus that he wants to support and provide for the boy. “He’s a top player. If we can keep hold of him in the summer, he’ll be a great asset for us next season. I think that will be a challenge in itself because he’s got real quality. He’s probably technically the best player we’ve got at the club. 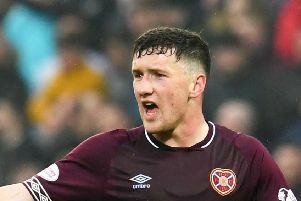 Walker himself credits Neilson and fellow Hearts coaches Stevie Crawford and Jack Ross for polishing his game and forcing him to improve on weaknesses. “I can’t thank the gaffer and the backroom staff enough for what they’ve done this season,” said the player. “They came in and identified what faults I had. They pushed me on and I think they’ll push me to the end of the season as well. I’m a lot fitter now because they’ve worked hard with me and it’s been great. “I think I’ve always had decent ability but off the ball I’ve improved so much. That’s all thanks to them for how they’ve worked with me throughout the season. Walker doesn’t need reminding that the hard work has really only just begun. Hearts’ rapid return to Scotland’s top flight has exceeded all expectations given the club only emerged from administration nine months ago. The Premiership will be nowhere near as straightforward. “We all realise it’s only the Championship. There is Rangers, Hibs, Falkirk and Queen of the South in the same league so you do get some pretty tough games, but everyone knows it’s going to be even harder next year. We will all need to prove ourselves next season in the Premiership,” said Walker, who feels a challenge for third place is not out of the question. “I’d say we should be capable of reaching the top six and maybe push for third place if we play well. We need to wait and see what happens. The management have brought a lot of this squad in and we do have quality players. Guys like Miguel [Pallardo], for example, who is far too good for this league. First, there is a party to be enjoyed at Tynecastle this weekend. Queen of the South are the visitors for a game which is now academic in terms of the title race but which every Hearts player is itching to play in. The need to continue winning amid the anticipated carnival atmosphere does not diminish, according to Walker. “No matter what happens, Hearts are a big club and this week and in the remaining games we’ll still be going out to get three points. We will go out against Queen of the South on Saturday trying to beat them. “We created a lot of chances at Falkirk at the weekend, scored three goals and could have scored more. They beat us last time at Tynecastle so I think we had a point to prove. It was a good victory. “This Saturday will be great. For any young player, you want to win trophies. We know it’s only the Championship but come the final whistle on Saturday, as long as we have three points, it will be a really good day.” In short, it will be the culmination of a season’s work which started way back last May when Neilson and director of football Craig Levein arrived. “It’s credit to Robbie, Craig and the backroom staff for what they’ve done this season. They’ve brought in a number of new players and we’ve got a great squad. I think we’ve been brilliant over the course of the season. “We’ve been so far ahead in the league that it’s always in the back of your mind when the day will come.